Deborah and I are living in the same time and we are seeing the same things. And we both know how the story ends…. be shattered, by the skeptics. due to hearts full of lust. give up all trust and hope. they no longer heed or cleave. 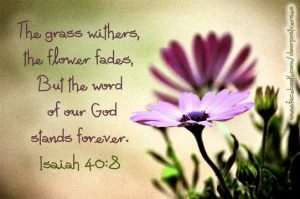 His Word still gives sight . . . This entry was posted on Sunday, April 27th, 2014 at 10:11 PM and is filed under Uncategorized. You can follow any responses to this entry through the RSS 2.0 feed. You can leave a response, or trackback from your own site.